Bob Dierk, site manager of JDSU in Roanoke, sees the company’s plans to move to The Bridges development in December as “getting in on the ground floor of a new and appealing area.” The technology company will be the first corporate tenant in the $100 million project, which is expected to transform a long-vacant stretch along the city’s South Jefferson Avenue into new apartments, offices and shops. 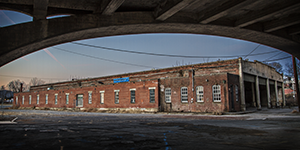 JDSU’s new office space will be in the Trolley Barn, a more than 100-year-old building in the newly designated National Roanoke River & Railroad Historic District. Redevelopment of the Trolley Barn is part of the first phase of The Bridges project, which also will include a 157-unit apartment complex, a restaurant and office space.